Navigation display based on the look and feel of the Honeywell Navigation Display used in Boeing (737-300-500,757,767) aircraft. 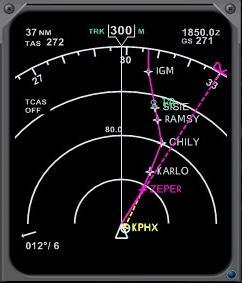 Displays ILS/approach or route NAV information in Map compass, and ARC modes. In arc mode the tuned active Navaid position and OBS radial is displayed relative to the aircraft's position. In Map/Arc mode displays view of of FMS selected departure, and arrival runways extended center in relation to aircraft's current locattion. Displays FMC calculated top of climb, top of descent positions. Displays nearby VOR's, NDB's,Intersection/Fixes and /or Airports when the Nav,APT,FIX modes are turned on. Displays nearby ARTCC/FIR Air traffic control boundaries (activated via .cfg option). Displays vertical deviation information in descent mode relative to the FMS calculated descent path. Displays in Map mode FMS specified reference Navaid/fix position, range arc, and radial relative to aircraft's current location. An EFIS control panel gauge is included to allow setting of the various Navigation Display modes.